INRIX is a useful app whether it’s used on a smartphone or on Glass: it can reroute on the fly to avoid traffic, offers voice activation, and includes a creative feature that shows friends waiting at your destination your estimated time of arrival, updated in real time. With Google Glass, INRIX allows users to keep their eyes pointed toward the road while looking at a map. Plus, you can take a quick picture of an accident or road obstruction to help notify the appropriate authorities quickly. 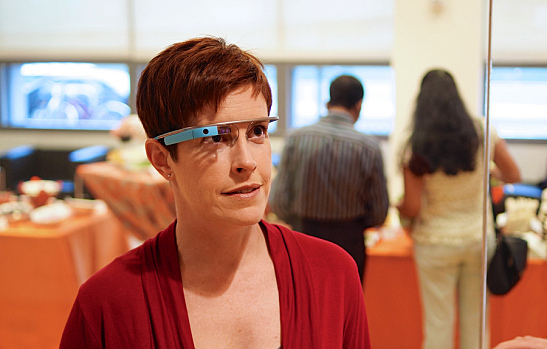 Some Google Glass apps have the potential to truly improve the world. WatchMeTalk is one such app, providing live text captions from audio input to help the deaf and hearing-impaired understand what is being said around them. Whether in a dinner conversation, a classroom, or a movie theater, the app picks up voices and converts them to text with almost no lag. Another feature makes this app useful for anyone, regardless of hearing ability: instant translation. If someone is speaking Mandarin to you, switch on WatchMeTalk and read a live feed in English text. The potential for travelers in a future world in which wearable computers are ubiquitous is staggering. This app’s developers tout it as a way to check your speed while driving without taking your eyes off the road. Hopefully, your car’s speedometer isn’t so poorly positioned that this is a legitimate problem; rather, this app seems attractive to speed-seeking adrenaline junkies who prefer their thrills on other vehicles. This app could be a fascinating tool for cyclists, skiers, skydivers, wing-suiters, and more—if Glass fits under their goggles. During a workshop at the Massachusetts Institute of Technology (MIT) Media Lab, developers played around with incorporating alternative sensors, input methods, and other technology into Google Glass apps, reports NewScientist. One student’s Glass activates a laser when he says, “OK, Glass. Terminate,” then takes a photo when he lifts his arm. Another has created an app that measures pupil dilation to detect attraction. Other students attempted to create a real-life Pokémon battle using a smartwatch and a motion-sensing wristband, like a Nintendo Wii without a screen. The possibilities for creative Google Glass apps are endless and intriguing, as demonstrated by some of the early apps and ideas. Do you think Google Glass will catch on? Are we at the beginning of a new era in wearable computing or witnessing a fading fad? NOW ACCEPTING Google Pixel and Samsung Galaxy S8!